I'm having an error with HBCD, latest version, 15.2. Extracted files at startup seems to get corrupted. This seems to happen when 7zDec.exe/7zDec2.exe is running. This file exists at dos.gz > dos.img. Tested with many different hardwares, no errors when using with another flash drives or CDs. No problems with the flash drive, which is a new, fast 128GB model from Corsair (CMFVYGT3A-128GB), latest revision. I've searched for an updated 7zDec, without success. Any suggestions? Does exist other EXE that could be used as 7zDec.exe/7zDec2.exe? Edited by David Lynch, 09 January 2014 - 03:58 PM. You mean it fails in the same way on different systems? There is no problem if a different flash drive is used and formatted in the same way and same filesystem? If so then it points to your new flash drive. Did you test the new flashdrive with FakeFlashTest or RMPrepUSB Quick SIze Test? Did you check the CRC/MD5/SHA1 hash with that of the original ISO? Yes, fails the same way on different systems, with the same new flash drive, which is perfect. Files are exact the same. I can even boot Windows from this USB flash drive with no error, so issue happens only with 7zDec.exe. When using with slower/older flash drives, I get no errors. Trying to get some help from the developer also. If speed is the issue then try running it under QEMU (use RMPrepUSB - Test using QEMU button). If it works then speed is the issue. If it still doesn't work then it probably is not a speed issue. 1. How do you know the USB Corsair drive is 'perfect' if you haven't tested it? 2. How have you prepared the USB drive and how are you booting HBCD? P.S. I have a Corsair Voyager GT USB 3.0 32GB USB pen and it works with Hirens..
Formatted with latest BootICE and using GRUB4DOS 0.4.6a. The exact same procedure was used with Corsair 64GB flash drives and they work. To me it seems that 7zDec.exe has possibly caching or timing issues on newer hardware. Works with QEMU - so could be timing? How about testing with VirtualBox on a USB 2.0 port and then test again on a USB 3.0 port. 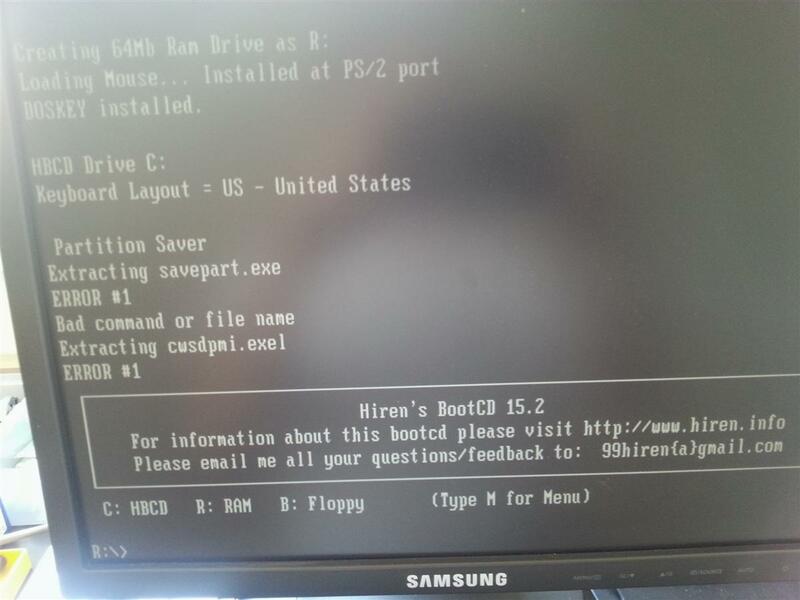 To boot from a USB pendrive with VBox use DavidB's Virtual Machine USB Boot tool (see Tutorial 4 on my site). P.S. 0.4.6a has bugs - try 0.4.5c 2013-11-30 version. Why do you say 'on newer hardware'? I thought you said the flash drive fails on ALL systems (and presumably on USB 3.0 and 2.0 ports too?). florin91, thanks, I've read your post before. What about 7zDec2.exe? It should be replaced also? If you look inside the .bat, it is used too. Does exist a newer version of it? Developer page of this specific build seems to be off. @steve6375: it was tested before with other combinations, previous versions of GRUB, Syslinux instead, etc. Same error. Edited by David Lynch, 09 January 2014 - 04:40 PM. By hardware I mean the flash drive itself, not the motherboard. Strange, unusual issue. I don't remember seeing something like this before. Edited by David Lynch, 09 January 2014 - 04:46 PM. Just to make sure I'm running DiskDoctor.exe from RMPrepUSB folder, Sequential READ. 32MB/s, 10%, so far no errors. Using it here from a USB 2.0 port on DiskDoctor. Does not seem to be a speed issue, but a timing/caching problem. 7zDec expects one thing and gets another. Time taken= 3918,781 seconds for 250183680 sectors. Edited by David Lynch, 09 January 2014 - 06:02 PM. Looks like at some point it had an 11mb/s xfer rate? If you increase the Set Slow Xfer Limit threshold to 15mb/s (or use Auto) then Disk Doctor should tell you where those sectors are. Confirmed that florin91 workaround does not work here (replaced 7zDec.exe with 7zdecdj2.exe from this package). Same error. Had no replies on this forum topic with developer. Return the flash drive as faulty and swap it for another of the same type? It is brand new, it is already a replacement. It works with everything except 7zDec. It even boots WinPE, and very fast. You haven't explained why it is a replacement? It works under QEMU - Does it work under VBox? How are you running Hirens from it? Is it extracted onto the drive? Is it NTFS or FAT32? are you using a dos.img file (made under MiniXP) or are you using the dos.gz file from the original ISO? Have you tried re-formatting the USB drive so that the \HBCD folder will be placed on different sectors on the drive (by copying on other large files first or by copying on the \HBCD folder first). Is it not conceivable that after 1 failure on the first drive and now this 'weird' symptom on this one, that these drives are rather suspect? To thoroughly factory test 128GB for defective sectors and remap them must take the factory ages. Maybe some of the sectors are bad or the firmware has bugs? 128GB is pretty unique for a flash drive and not many people will have tested them under real conditions in the 'field' yet? Tried to use 7z.exe instead of 7zDec (the latest console version) with similar errors. Believe me, I've tested everything here on it with no issues except this specific stage of HBCD boot. One of the last tests that I've done was the extraction of Tools.7z with 7zDec.exe on a Windows XP prompt, running straight from this flash drive. No errors. It is a original drive. Had a replacement straight from Corsair. BTW, excellent service. Edited by David Lynch, 13 January 2014 - 10:55 PM.